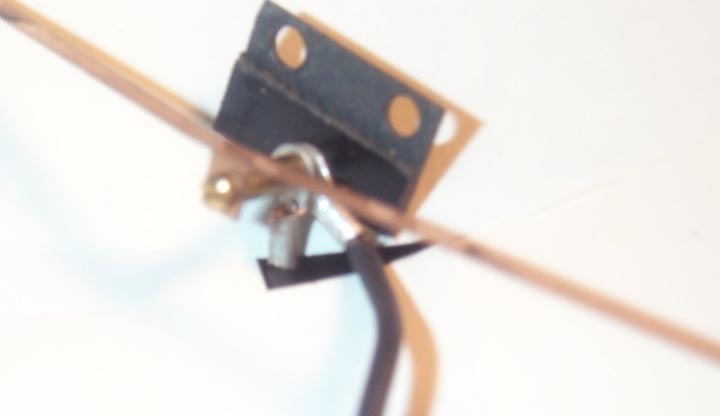 This page shows several different techniques for installing my electrical pickup wipers. The first set of three photos shows the parts used and then the installion of wipers on PSC caboose trucks that have a channel section bolster. The second set of two photos shows the installation of wipers on the insulated side of a Key F7. The third set of photos shows wipers installed on Oriental Limited SW-7 trucks. The fourth set of photos describes installation of the wipers on P&D Blomberg trucks. Hopefully the photos and captions are self-explanatory. If you have any questions please let me know. Here is an overall view of wipers installed on both the insulated and uninsulated sides of a truck for a PSC caboose. The purpose of adding wipers was to provide power for the marker lights. Here is a view of the parts used on the insulated side. The length of the wiper was truncated when the image was processed. Note the phenolic stand-off that raises the wiper above the channel section of the truck bolster. Also note the 0-80 plastic screw that keeps everything insulated from the truck frame. Wire lugs like that shown are available from me; they are sized for either 0-80 or 2-56 screws, and will accommodate up to 22 gauge wire. With them the wiring is a lot cleaner in appearance and much easier to work with if something has to be maintained or tweaked. Note in the first photo that the wiper tab has been bent 90 degrees and that the wiper has been trimmed so that it clears the insulating bushing on the wheel center. This photo shows the parts used on the uninsulated side of the truck. Note that the screw is now brass since it is not necessary to insulate this side from the truck frame. A separate wiper is used, one for each axle, because that is simpler. Note in the first photo that the wipers have been bent into a "gull wing" (anybody remember the F4U Corsair?) shape in order to clear the channel. This photo shows wipers installed on the insulated side of of the rear truck on a Key F A unit. 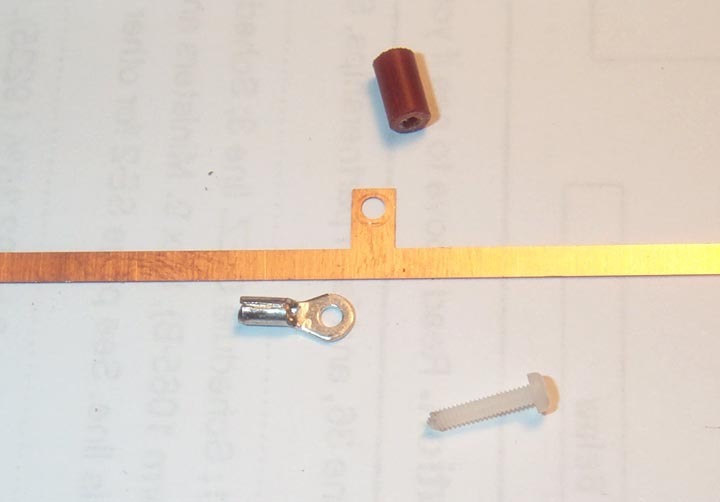 The brass wiper mount stand-off (see parts photo below) is mounted in a plastic strip that has been machined to fit the truck/bolster joint. The plastic strip mount insulates the wiper assembly from the truck frame. This view shows the wiper assembly separated from the truck. Several pieces of paper were inserted under the assembly to make things more visible. The dark pointed area through which one wire run passes is where the three pieces of paper meet. 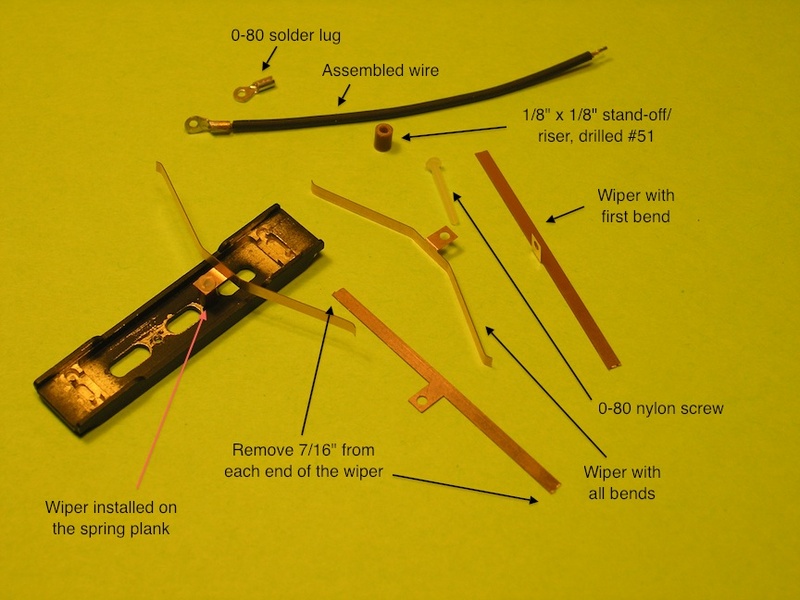 The main purpose of this photo is to show you the sequence of assembly of the wiper, and how the plastic block was machined for a compatible fit with the sideframe and bolster. 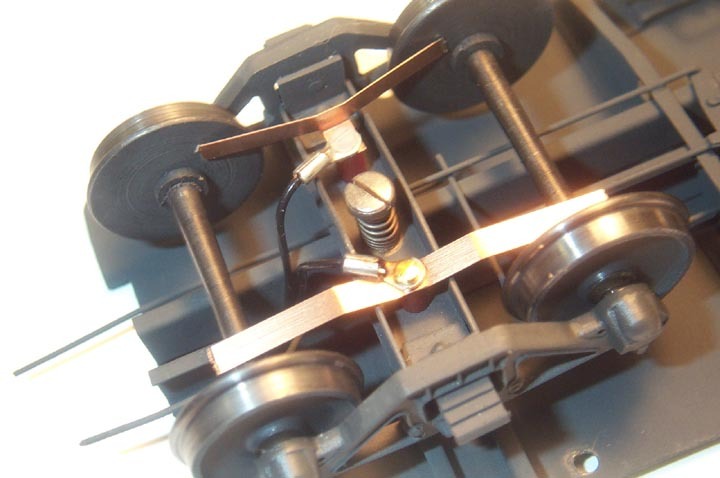 This view shows wipers installed on an Orientl Limited SW-7. Note that the wipers on the insulated side are mounted to a piece of phenolic sheet in order to insulate them from the truck. Also note the flanges on the insulated wipers which serve to keep them from moving off the wheel as the wheelset moves from side to side during normal running. 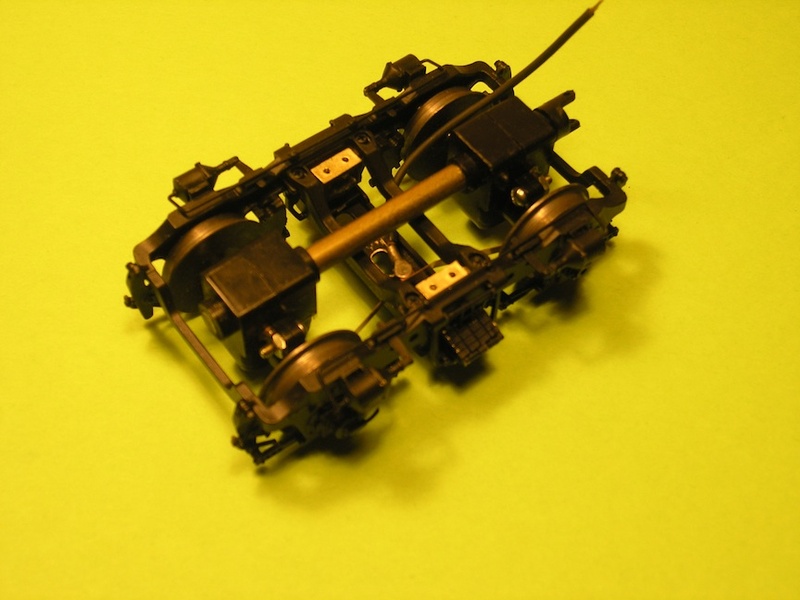 Once the trucks have been removed from the chassis, remove the spring planks by removing the bolsters (4 screws) and the springs (push towards the inside of the truck to remove), then slide the plank out to the side. 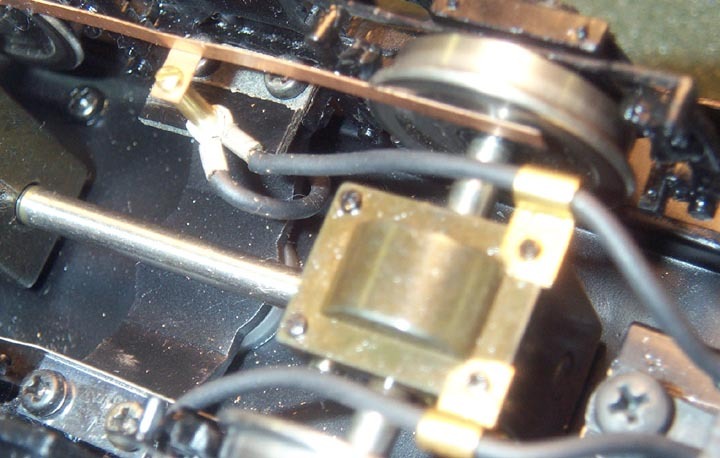 TIP: while you have the chassis out of the unit, inspect the helmet on the motor shaft. On both units, which were older, one helmet was split and the other was mis-installed on the motor shaft, allowing it to slip. If you find a problem with the helmets, you can send the motor and helmet to me. 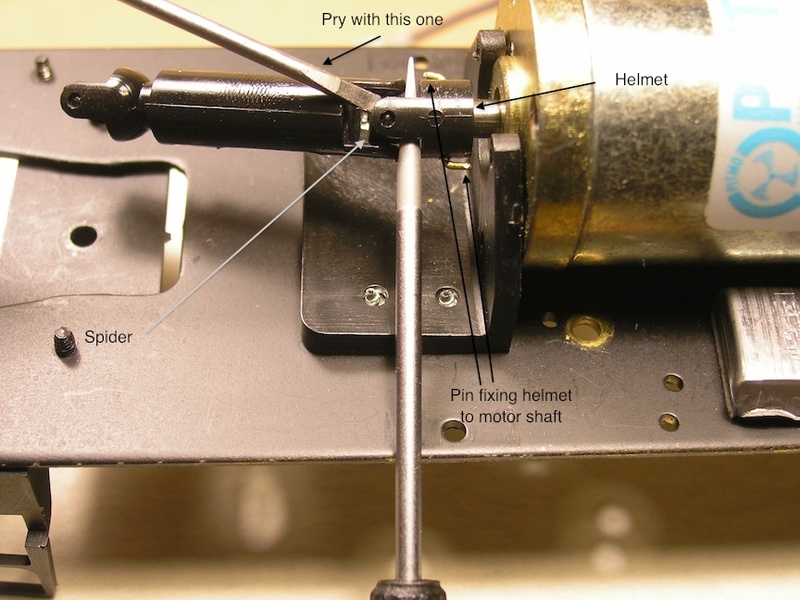 I will replace the helmet with the same item from my stock but machined so it is a slip fit (won't split) on the motor shaft and pinned in place - see the photo above. The cost for this is $25 plus return shipping. P&D may perform the repair, possibly for less so check with them too. 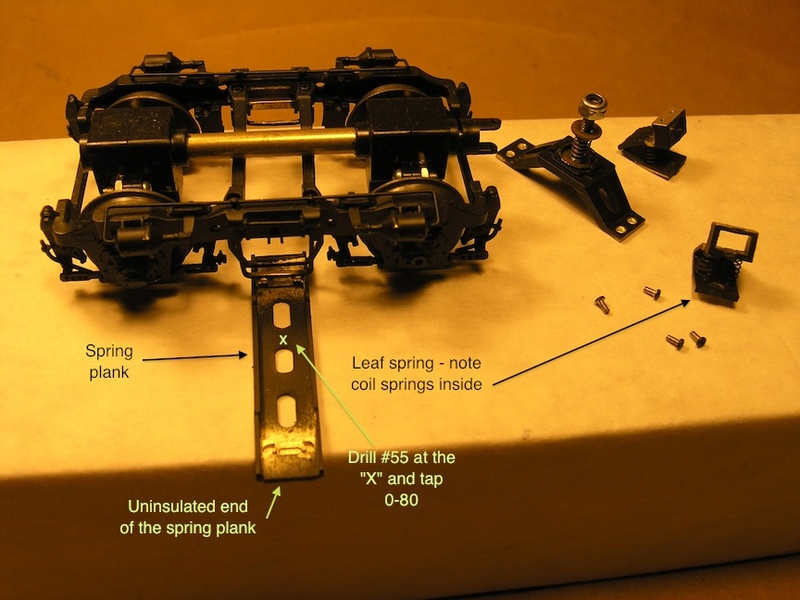 The above photo shows the spring plank removed from the P&D truck along with the parts that had to removed in order to get the plank out. Drill the spring plank #55 as shown. Tap the hole 0-80. 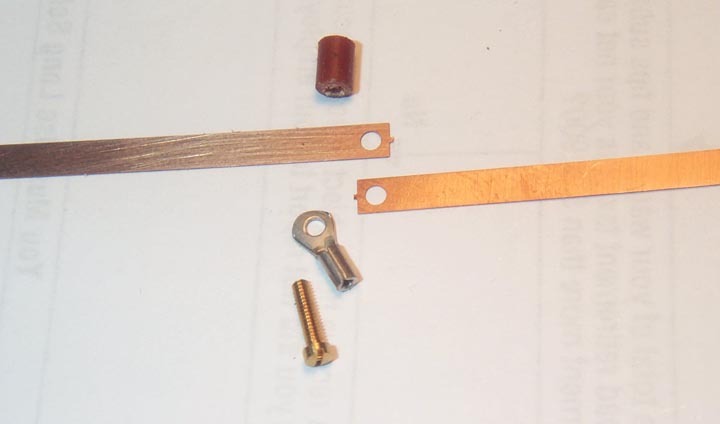 Above are the parts needed to install the wipers. One wiper is shown installed on the plank, but note that you cannot insert the plank into the truck with the wiper installed - you have to install the wiper after the plank has been installed in the truck. Some notes on the parts used. The wipers, obviously, are available from me. The phenolic stand-offs/risers are 1/8" diameter x 1/8" long - the length is critical for the wiper to clear the metal parts of the truck; I will make them for you at a cost of $20 for four plus $5 for every additional four; ready-made risers may be available - sometimes it is faster for me to make something than to take the time to look for it particularly if experience dictates the size is outside what is normally available. The nylon screws are NWSL #14126-5 (that may be the 100 count pack number). The wire is Belden 24 gauge black rubber coated test lead wire; I like it because it is super flexible. It is available from me for $1.00 per foot. You may note there are two holes drilled in the plank rather than the one I indicate above. Sometimes it is faster to have an extra hole in something that is symmetric and that can be installed backwards (drilled hole on the uninsulated side - oops), then just use the "extra" hole. Faster than taking the incorrectly installed part out and re-installing it. Here is the truck with the wiper installed. It is tricky working inside that space. Make sure the springs are properly seated and that the bolster can be installed (screw holes line up) before installing the wiper. I found that gluing the riser to the spring plank gives one less thing to get into position, be sure to clean any glue out of the threads before attempting to install the screw. Put the wiper by itself into position first, then add the other parts. A screw holder also helps to get everything lined up and the screw started in its hole, I also used some long tweezers on the solder lug to keep the lug in position. Once the screw is home (don't tighten it so much that you strip the soft threads), cut off the excess from the bottom of the plank; use the cut off part to estimate how much to shorten the other screws before you install additional wipers. The photo is slightly out of focus with respect to the truck itself as I wanted the screw head and solder lug to be in focus. 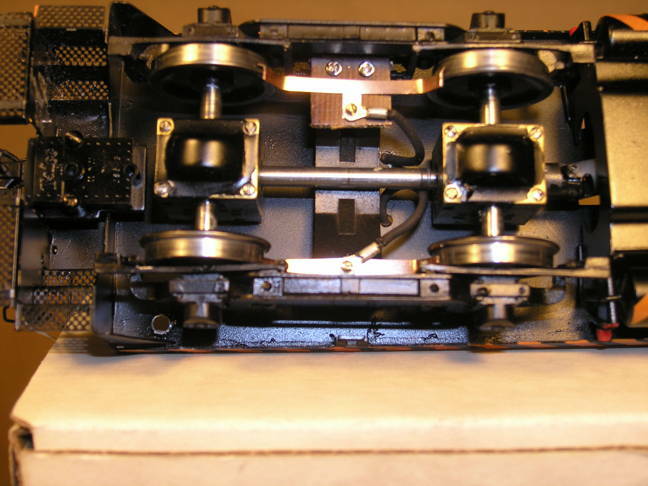 Interested in learning more about 2-rail O scale? Please visit the O Scale Kings web pages. These web pages were designed and implemented by Rod Miller.